Gerbils might not seem like the type of animal that needs to be tamed, but it really just refers to training the gerbil to come to you without being afraid. When that happens, you can pick up and play with your gerbil without any fear—on your part or the gerbil's. The best way is to carry gerbil is simply cupped in the palm of the hand. You can gently hold the scruff of the neck (hold the loose skin on the back of the neck) to prevent the gerbil from getting away, if necessary. Never pick up a gerbil by the tail. If you are not comfortable picking up an untamed gerbil, then allow the gerbil to walk into a cup turned on its side, or gently direct the gerbil into the cup, and then tip the cup up to carry the gerbil. Place a hand over the cup as gerbils can jump very well. You can also use a cardboard tube (e.g. from a paper towel roll) for this purpose. Make the process of taming a gerbil easier by starting with a pair of young animals. Although some people fear that it will be more difficult to tame multiple gerbils, because they bond with each other, a single gerbil is likely to be stressed and nervous and therefore may be more difficult to tame. Use lots of treats and work in small steps, making sure your gerbils are comfortable with each step before proceeding to the next. It is probably best not to allow the gerbils to run around outside the cage until they are tame—the stress of chasing, catching, and returning them to the cage may scare them and make them fear you. Start just sitting next to cage to acclimate gerbils to your presence. Move slowly and speak softly around the gerbils. Limit interaction to times when the gerbil is awake—waking a gerbil isn't a good way to gain its trust! Offer a treat, such as sunflower or pumpkin seeds, when the gerbil approaches the cage bars. Once your gerbils are comfortable taking treats from your hand through the bars of the cage, offer the treat through an open cage door. Once your gerbil happily takes treats from your hand, place a treat on your open hand to entice a gerbil to step up onto hand to retrieve the treat. Once your gerbil doesn't hesitate to touch your hand, place a treat on your forearm and allow gerbil to climb onto your hand to get the treat. When your gerbils are comfortable climbing on your hand, try gently scratching the sides and back of their heads (imitating natural grooming behavior of gerbils). Avoid chasing or grabbing the gerbils to get them back into their cage if they have been out. Try to entice the gerbils back with favorite treats, or try to gently herd them back to the cage. Handle your gerbils regularly to keep them well socialized. 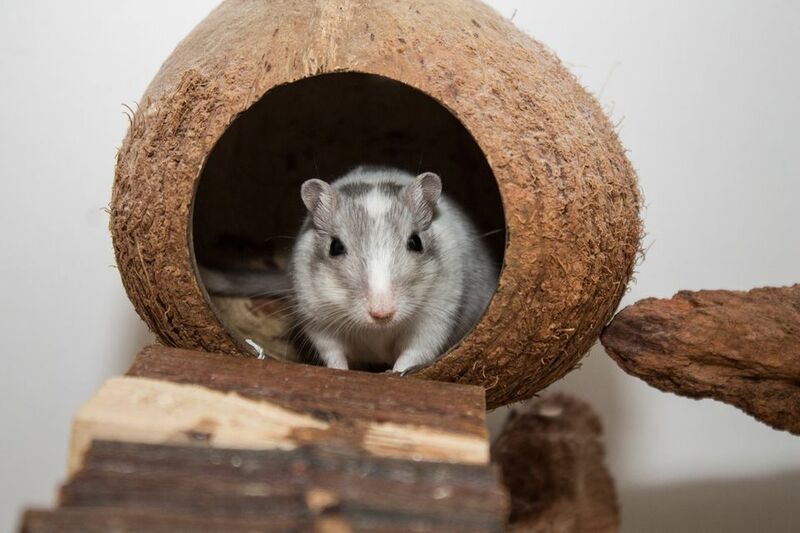 Gerbils are active and curious and will appreciate daily time outside the cage.